HOMEREDI is a full service Design and Build Company with decades of residential construction experience servicing our discerning clients in the North Shore of Long Island. Our trained and experienced staff members are able to address every aspect of your Construction needs for any size extensions, second floor dormers to full knock down and re-build projects. 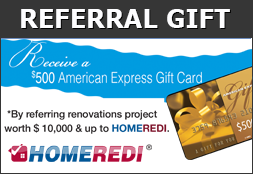 We at HOMEREDI believe in being very hands-on from the moment we are engaged in your project. Every Aspect of each project is meticulously managed and each project regardless of its size, scope and complexity receives a dedicated project manager that keeps you the Home Owner and all other selected team members such as AIA certified Architects, ASID Designers, all required Screened and Licensed partners abreast of each events as they are scheduled for implementation. Plumbing, Heating, CAC, HVAC Design & Installations.